Do you have any ideas on how to stop the crazy? My entire class is convinced that humans really are eusocial and my professor told me to stop posting my opinions when I said that we're not eusocial by any falsifiable definition. Bear in mind my classmates are supposedly going to be future business leaders. Most of them don't even accept climate change. Thanks for the help. I think I'm going to have an aneurism during the midterm when I'm forced to say we're eusocial because my grade depends on it. he says it's an opinion. FWIW I certainly think humans are a variant of eusocial. denoting social organisms (e.g. the honeybee) in which a single female or caste produces the offspring and non-reproductive individuals cooperate in caring for the young. while in humans reproduction is not eliminated as with drones....ask any untouchable how well the caste system in India benefits the Brahmins and disadvantages the untouchables. I really do sympathise with your predicament. This is the multifariously authored paper published as a counter to Nowak, Tarnita and Wilson 2010. Macdoc wrote: FWIW I certainly think humans are a variant of eusocial. To unpack this a bit. No, it is not an opinion, it is a model. Models can be tested, and this one has been, quite a bit. Opinions can also be tested, by producing a model, and testing it. What is Wilson's testable model? How has Wilson's model performed in testing? Are it's predictions different to Hamilton's, complementary to Hamilton's, or do they reduce to special cases of Hamilton's model? And no, humans are not the only available test subjects. According to https://whyevolutionistrue.wordpress.co ... y-biology/ Wilson didn't even vary r in his work attacking kin selection. Fenrir wrote: That is uncalled for. 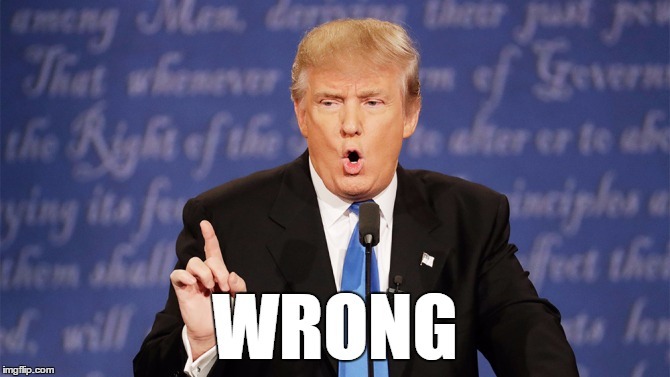 So was geneticallydead posting a picture of Trump with the word "wrong" blazoned on it. You're one image too late to be complaining about people posting "uncalled for" images. Er, isn't a photo of Trump, with the comment "Wrong", an indication/admission that you're right? chairman bill wrote: Er, isn't a photo of Trump, with the comment "Wrong", an indication/admission that you're right? Oh, and by the way, humans aren't eusocial - we don't have a division of reproductive labour beyond that which is genetically determined (i.e. women do most of the work). Citing a particular, very rare and completely cultural example does not alter the biological fact that Homo Sapiences is not a eusocial species. Most people, for most of human history, who procreated, succeeded in procreating regardless of social or economic status. The farmer had children, just as the nobleman did. The farmer CAN have children, even when for whatever reason he refrains from it. A eusocial species is one in which there is an entire class that never reproduces because they physically can't, because they have evolved not to. The fact that a species of sentient organisms can artificially mimic this pattern through some set of synthetic cultural rules, doesn't make it into a eusocial species. Who or what is OEs? For what it's worth... I started writing an actual response before I figured, "I've argued the point enough to the professor. I'll just go with daddy Trump"